PlatinumOne what if you don't have Sigarda's Aid in play? None of the equipment carriers that you just mentioned, save for maybe puresteel, are good enough to warrant playing on their own. 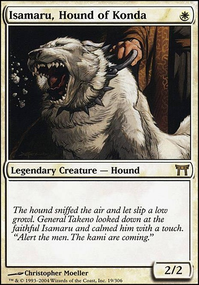 An equipment deck needs to use its equipment to help already good creatures hit an even higher ceiling. 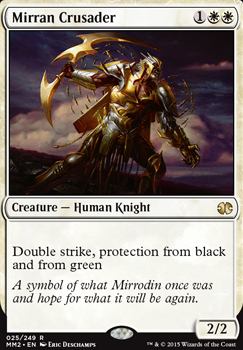 I'd argue that the only creatures that modern has that fit that bill are Mirran Crusader and Phyrexian Crusader , MAYBE with Puresteel Paladin (but he's far better in Cheerios where he can be a draw engine). Maybe Sram, Senior Edificer makes its way into modern equipment lists too... but I'm gonna hold onto my skepticism because I've gotten stuck in modern goldfish bowls a few too many times to jump into a new one so eagerly. 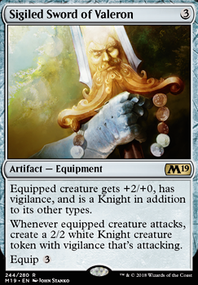 Given how lackluster modern's "stick holders" are in general, I think SFM is either fetching up top-end equipment to close out games ( Batterskull specifically), OR specifically Sword of the Meek as a good tutor for that part of the thopter sword combo. The swords of X and Y are good, but modern has too much good removal relative to the mana costs of the swords for me to believe they'll make a deck T1. Assassin's Trophy , Abrupt Decay , Cindervines , all creature removal in response to attempts to equip... I don't see the swords overcoming the huge tempo disadvantage that they represent when combined with the fact that you need to have a living, unequipped creature to equip them to. That's a huge ask in modern which STILL loses to a Reality Smasher . I guess you could rock Mirran Crusader and Phyrexian Crusader with the swords and SFM, but at that point you're so all in on the equipment strategy that you're really playing B/W equipment midrange, and not any other strategy. I'm not sure that B/W equipment midrange is good enough to be a top tier deck. Don't get me wrong, it has all the potential (good removal from Path to Exile / Fatal Push , hand disruption from Black), but it lacks card draw, and that's a huge problem for a deck that's trying to put sticks on creatures. 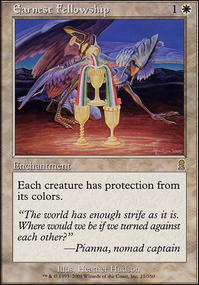 Your creatures start counting for 2 cards instead of 1, which makes a B/W midrange deck have to fight an uphill value battle against decks that will undoubtedly be faster. Batterskull as a new control wincon is fine. Having 1-2 Vigilant, lifelinking beaters that can dodge relevant removal at instant speed is nuts for a control deck. Cheating those in for 2 at instant speed is definitely the nuts. As far as thopter sword goes ( Sword of the Meek + Thopter Foundry )... 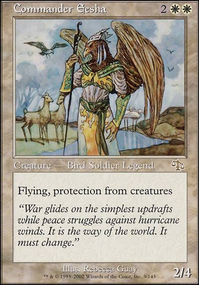 The deck struggles to find its combo components in time, and being able to replace some of your Muddle the Mixture / Whir of Invention // Gifts Ungiven s (which are good cards but super slow tempo wise) with a body that blocks and tutors for just ? That sounds good, and might just be the push the deck needs to really hit the competitive scene. Mirran Crusader holding a scars block sword of x and y, all the power of ending the game with a combo, but in the hands of a small human knight holding an equipment, so good, best standard formats no contest.